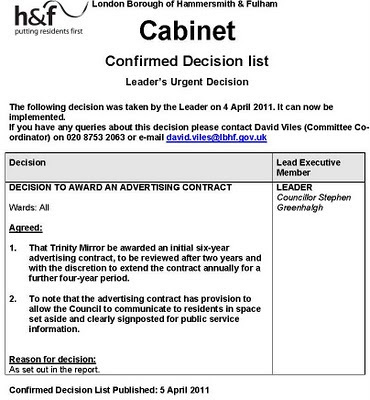 Last Monday, the Conservative Leader of H&F Council signed an "urgent decision" order awarding £75,000.00 a year of tax payers' money to be spent on advertising and propaganda in the pages of the Fulham and Hammersmith Chronicle. 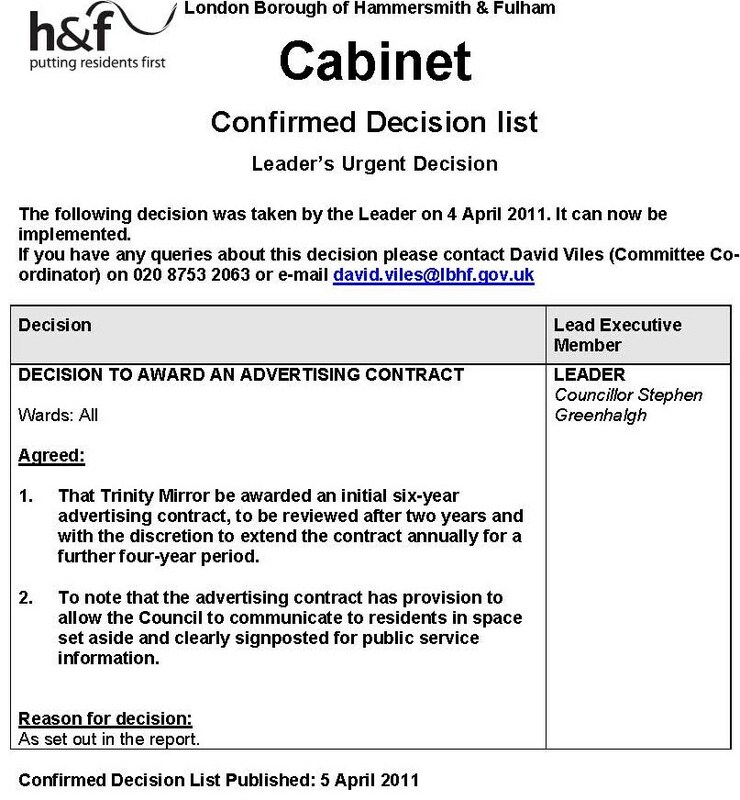 At the last local elections my Labour colleagues and I made a manifesto commitment to limit all Council advertising spend to that which it is obliged to do by law - such as publicising planning applications, etc. I therefore believe it is wrong for the Conservatives to seek to tie the hands of any future Labour Administration on this matter and will take every possible measure and undertake every possible legal action to stop this unnecessary spend if the electorate makes Labour the local administration in 2014. H&F Council claims that £36,500.00 of this new contract is for statutory notices. So that leaves £38,500.00 for propaganda and this figure doesn't include the costs of H&F council's press officers' pay, national insurance and pension contributions who will still be writing their spin. It was just six weeks ago that H&F Conservatives announced draconian cuts to local police, schools, Sure Start, voluntary groups, elderly and disabled people's care and environmental services. Surely someone in the Administration realises that it is an insult to those suffering the consequences of those cuts to waste £38,500.00 on a propaganda contract? Chris Underwood of the Shepherds Bush Blog gives this detailed report and tells us H&F Council's spin doctors may now actually be working in the Chronicle's new Hammersmith offices in a move that begs the question surely this relationship is too close for comfort? You can read the Council's version of events here. The Chronicle began discussions with H&F Council and senior Conservative Administration Councillors about a year ago. Around that time the Tory Chair of a Parliamentary Select Committee had accused H&F Conservatives of publishing "propaganda on the rates." When the government made it clear that they would force H&F Conservatives to close down H&F News the Administration sought loop holds in the law that would allow it to continue with its Town Hall Pravda. I do appreciate the difficult financial circumstances all newspaper owners face. Increased competition from web based media and an economic situation that is squeezing advertising spend have put many papers out of business. So £75,000.00 of public money would be a welcome addition to the Chronicle's revenue. H&F News had also raised revenue by selling advertising, sponsorship and promotions. If all of that money has gone to the Chronicle then I can see why this deal is seen by them as very attractive. However, I for one feel deeply uncomfortable with the propaganda element of this deal. To date, H&F Conservatives have used H&F News to spread "political propaganda" and blatantly mislead members of the public. What will the Chronicle do if the Council uses its paid for "public service information" pages in the Chronicle to do the same? Will it run another story elsewhere in the same paper attacking the Council's claims? Have these negotiations already affected the nature of the Chronicle's reporting over the last year? How will this close relationship affect the stories the Chronicle choses to report and how it reports them in the future? I'll leave you the readers to judge but this signifies a different type of relationship between H&F Council and the Fulham and Hammersmith Chronicle to how it was previously up and until the acclaimed "proper paper" campaign which the Chronicle ran against the local authority last year. There are real concerns about how our Council has approached this. We don't live in North Korea or Libya and I strongly believe that in a free democratic society governments (national or local) should not publish their own media that puts their spin on their actions. It was wrong when it happened in H&F News and it will still be wrong if propaganda appears in the pages of a local paper. And, given these difficult financial times this is quite obviously a waste of tax payers' money. I will report more as this story unfolds. It is interesting that this contract is up for renewal the year prior to the next local elections. It appears that the Conservatives have cleverly found a way to curtail the fierce criticism the Chronicle used to level against their council. What a clever ruse.